A glass tube and some chip packets could be the key to preventing millions of deaths, local students say. University of Adelaide mechanical engineering students have designed a low-cost and easily made drinking water treatment system that can remove potentially deadly bacteria in minutes. The project was specifically tailored to local conditions in the Papua New Guinea highlands, where many villages use large communal rainwater tanks in the wet season and river water in the dry season. Both sources are prone to pathogens in the water. The system makes use of UVA radiation direct from the sun to kill pathogens in the water, using a continuous feed facility that can be made from improvised materials. “We wanted something where we could provide design guidelines and let the local communities build and install their own systems using readily available materials that could be easily maintained and replaced,” said project supervisor Dr Cristian Birzer. The students - Michael Watchman, Harrison Evans, Mark Padovan and Anthony Liew - first designed and tested a workshop manufactured system using high-quality materials. They then designed, built and tested a much more rudimentary version of the design, using plywood, glass tubing and high-density polyethylene plastic sheeting coated with metalised plastic (chip packets). 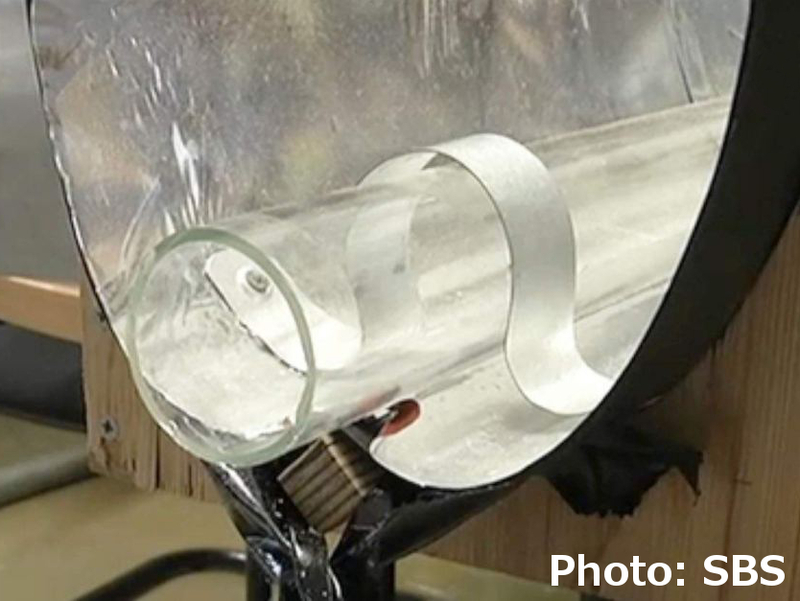 The chip bags were specially shaped to reflect the maximum amount of sunlight onto the water in the glass tube. “The students trialled various reflectants and found the inside of crisp packets was as good as anything,” Dr Birzer said. The UVA from the sun produces “reactive oxygen species” in water, damaging the DNA of pathogens and deactivating them. Tests in a nearby medical lab showed the system could reduce high concentrations of E.Coli to undetectable levels in the water in under 30 minutes. “The system can successfully treat close to 40 litres in four hours and the beauty is that it's designed to be modular, so more modules can be added for greater quantities of water,” Dr Birzer said. The design was produced as part of a project by ChildFund Australia, and has now been presented to the aid group in PNG.